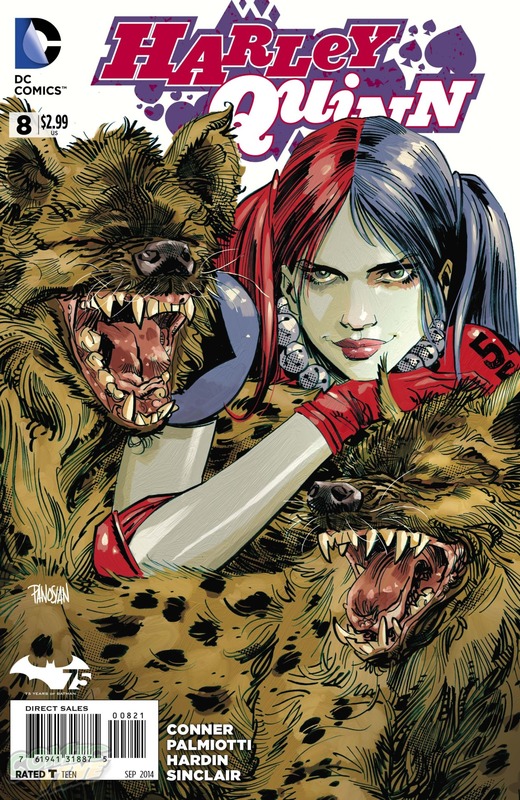 Welcome back fellow fans of fantastic fiction to another instalment of Comic Cover Of The Week, and this week our spotlight of splendour falls upon “Harley Quinn: Road Trip Special #1.” What do you get when you take DC’s most popular female psychotic, throw in a little feline felon, plus a dash of vined vixen?, the long awaited return of the excessively popular trio known as the Gotham City Sirens, of course! 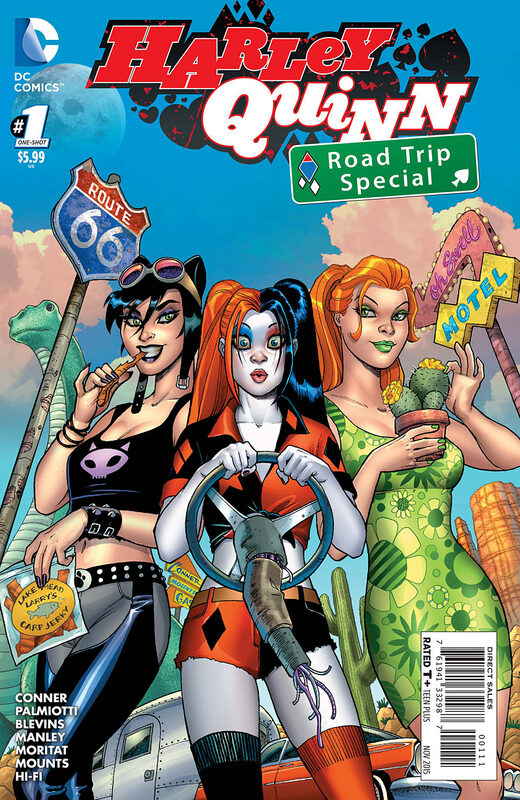 That’s right Harley, Catwoman and Poison Ivy team up once more on a crazy cross country road trip chock full of mirth, madness and mayhem. Writers Amanda Conner and Jimmy Palmiotti present us with another fast and frantic issue that really showcases why the popular 2009-2011 series Gotham City Sirens needs to return… pronto! As with most stories starring the mischievous minx of mirth, this offers a fun and light-hearted tale that follows our terrific trio as they travel across America, so Harley can attempt to fulfill her Uncle’s dying wish to transport his ashes to Long Island… and of course, as always, utter chaos ensues. New comics Wednesday is upon us once more, and this weeks cover spotlight falls upon Starfire #2, another magnificent piece by the always astounding Amanda Conner. Even though we are only into the second issue of this brand new series starring everyone’s favourite alien princess, I am already hooked. Awesome cover aside, the story itself is an amusing and heartwarming tale of an outsider coming to terms with her sense of place in a distinctly different culture. 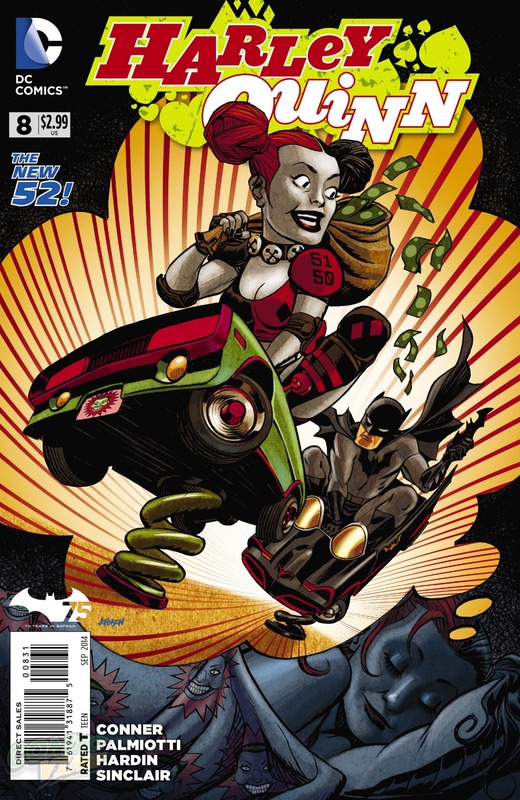 Conner and Palmiotti’s narrative is hilarious as ever, easily as funny as their fantastic run on the Harley Quinn series, and the interior art by Emanuela Lupacchino is absolutely stunning. 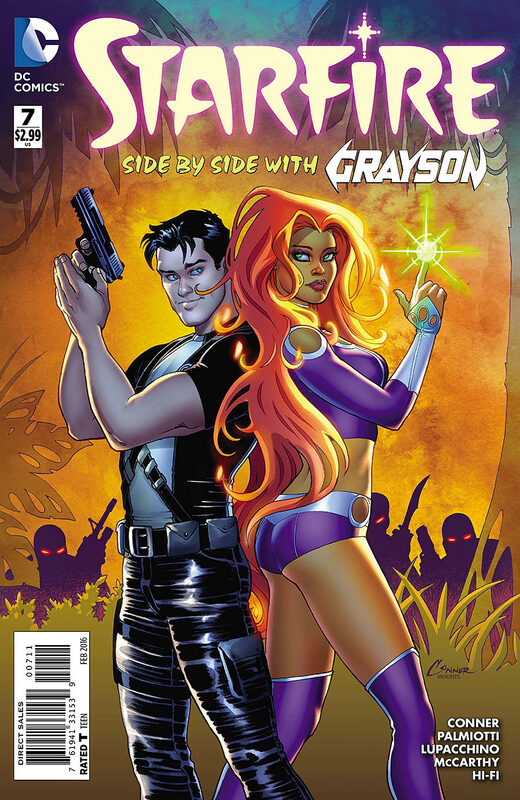 Starfire #2 is available at your local comic-book emporium right now. Written by: Amanda Conner and Jimmy Palmiotti. Cover by: Amanda Conner. Variant cover and interior art by: Emanuela Lupacchino. 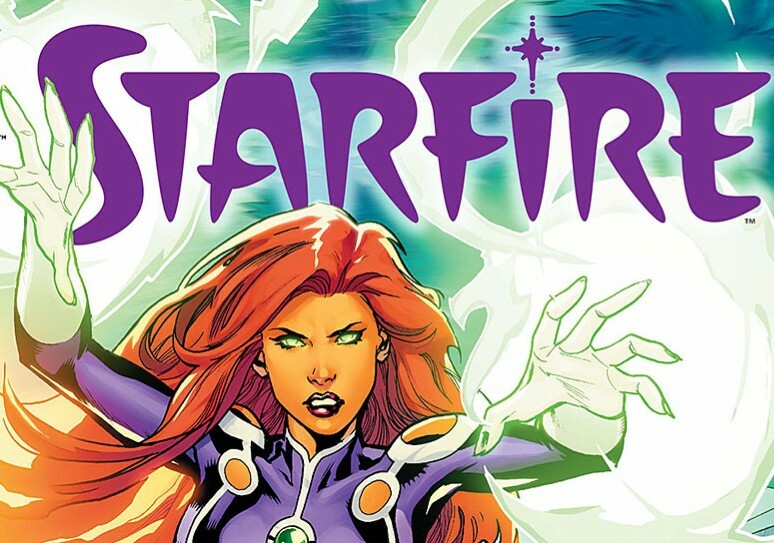 The pick of this week’s comic covers stars everyone’s favourite alien princess, the inimitable Starfire. 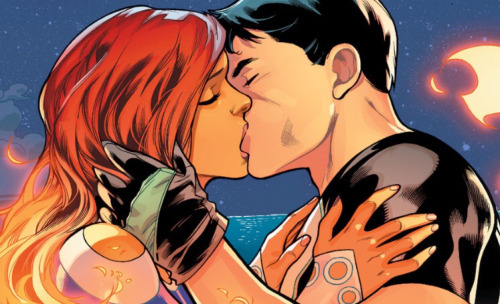 Brought to you by the talent behind the extremely successful Harley Quinn series, the amazing Amanda Conner and her fellow comic book creator (and husband) Jimmy Palmiotti. 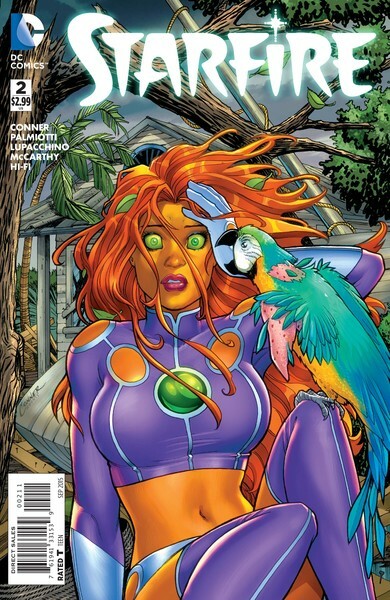 It’s a new beginning for Koriand’r (Starfire) former Teen Titan, and one time member of the Outlaws, as she seeks the advice of Stella Gomez, Sheriff of Key West, on the best place to live now that she is making her own way in the world. Finally, Koriand’r gets her own series. 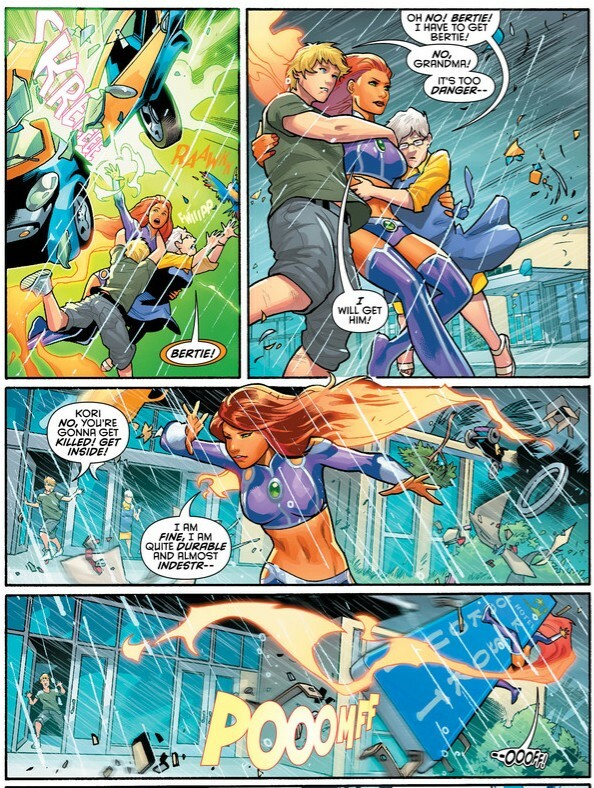 As much as I enjoyed her part in the “Red Hood and the Outlaws” run (which comes highly recommended, by the way) I have always thought that as a character, Starfire is more than capable of carrying her own ongoing solo comic. And here it is, brought to you by two of comics most popular and talented creators. If you haven’t read any of her previous adventures, now is the perfect time to acquaint yourself with DC’s fiery alien warrior princess, with this brand new monthly series. 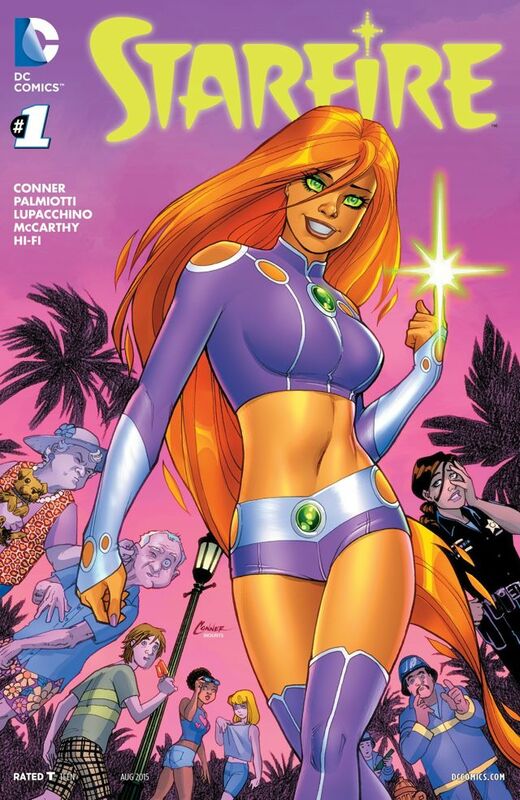 Starfire #1 is available at your local comic-book emporium right now. Written by: Jimmy Palmiotti and Amanda Conner. Cover by: Amanda Conner. Variant cover by: Emanuella Lupacchino. Interior art by: Emanuella Lupacchino. 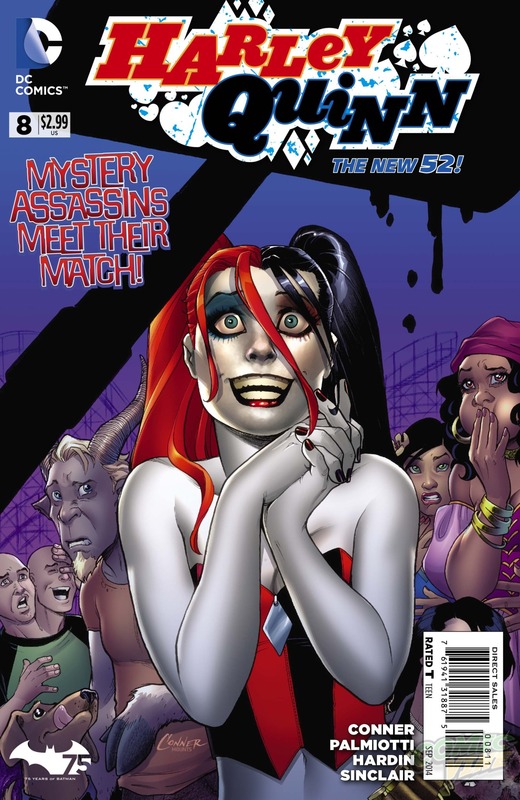 New Comics Spotlight: Harley Quinn #8. 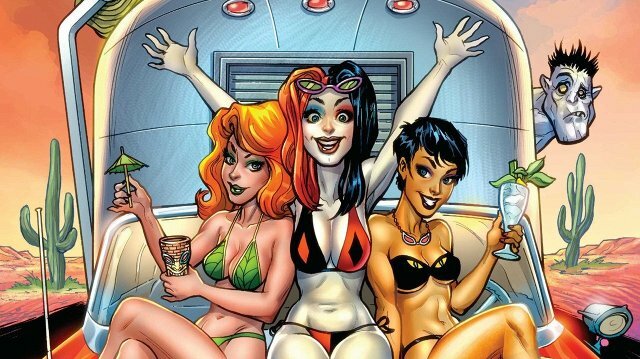 Welcome comic fans to another new comics Wednesday, today we are recommending our favourite Cupid of crime..the inimitable Harley Quinn, Mr J’s favourite lady has no less than three variant covers for her July issue. The monthly comic book series has been a massive success so far with the fans as they follow the misadventures of the Mistress of mischief, we have been enjoying miss Quinn’s adventures immensely which is no surprise when you have a comic book dream-team like Jimmy Palmiotti and Amanda Conner creating her monthly escapades. This is another fantastically fun issue with Harley finally facing off with her mysterious assassins and deciding it’s time to unleash the ‘Scatapult’! Precinct1313 rating: 5 mallets out of 5.